The dramatic growth of open access, both publishing and self-archiving, continued in the final quarter of 2006. The Directory of Open Access Journals passed a significant milestone in December, exceeding 2,500 journals; about 10% of the world's peer-reviewed journals are now fully open access. When new journals are created, there is evidence that they are at least 30% likely to be fully open access. This trend is likely to accelerate as more journals become knowledgeable about new, efficienct, freely available open source software such as Open Journal Systems, which greatly facilitates online and open access publishing. My predictions for 2007 are continued, and accelerating, growth in open access. The most important trends I see for 2007, however, are less tangible in nature; a shift in focus from debate on the pros, cons, and feasibility of open access, to more solid work on the details of implementation. For librarians, a key will be a shift in perspective on collections, from the idea of purchasing or leasing what our users need, to building and preserving the collections our researchers and others produce. I see this trend as beginning in 2007. The final quarter of 2006 showed continuing strongth growth in open access in all measures tracked, with the equivalent of annual growth rates ranging from 19% (for DOAJ) and up. Particularly strong growth is noteworthy for E-LIS, with a growth rate equivalent to 55% annually (586 documents added), and PubMedCentral, with an annual equivalent of 40% (69,884). Comments: strong growth in both E-LIS and PubMedCentral illustrates that different approaches to implementing open access can be highly successful. E-LIS, the Open Archive for Library and Information Studies, is a highly distributed and volunteer-based organization, with volunteer Editors around the world and a very small central staff in Italy. PubMedCentral is a project of the U.S.' National Institutes of Health, and is a highly centralized organization with paid staff. Strong growth in open access, fairly steady with some seasonable variations or local factors affecting rate of change for particular initiatives, is now confirmed, for open access publishing and archiving, throughout 2006. The Directory of Open Access Journals exceeded 2,500 journals this December; for details, see their Dec. 15 Press Release 2,500 journals in the DOAJ. It is estimated that there are about 25,000 peer-reviewed journals in the world; if this estimate is correct, then now 10% of peer-reviewed journals are now fully open access. While the growth in open access journals is coming from both conversions of existing journals and development of new journals as open access, there is evidence of a increasing tendency for new journals to start up as open access, as discussed in my blogpost of yesterday, The Newer the Journal, the More Likely it is Open Access. According to Ulrich's, journals with start years from the previous century are less than 10% likely to be open access, while journals started in the new millenium are about 30% likely to be open access. There are definite limitations to Ulrich's data on open access journals, particularly evidence of understatement of open access journals. One new measure added to this quarter's Dramatic Growth update is the estimate of 800 journals now using Open Journal Systems, in 10 languages. While the precise number at different points in time is not known for this free, open source software, this is remarkable usage and development for a software just released in 2003. This is significant because the efficiences of this new breed of software, and the free availability, is an important support for open access publishing. [Disclosure: I am on the planning committee for the First International PKP Scholarly Publishing Conference]. There were many indications in 2006 of an open access movement that is on the verge of emerging from the innovative edge into the mainstream; most notably the open access policies either developed (e.g. RCUK), coming into effect (Wellcome Trust), or begun this year (e.g. FRPAA, the Australian Research Council, and the Canadian Institutes of Health Research). The phenomenon of open access is already well established as an area of scholarly study in its own right, as readers of Peter Suber's wonderful Open Access News blog, which exceeded 10,000 well-selected, informative and interesting posts in December; and the monthly SPARC Open Access Newsletter,which passed the 100 mark earlier in the year. Despite these signs of maturity, implementation of open access is still in the very early stages, which will make the next few years most interesting indeed. One illustration of the coming explosion in growth of open access relates to the beginnings of broad-based education on open access per se. While Peter Suber and other early leaders have been teaching those who chose to learn for many years, others are still preparing to teach. In May of 2007, the University of British Columbia's School of Library and Information Studies (SLAIS) will be offering a course on open access for the first time, which I will be teaching. Students are already hearing about open access in many of their classes. Like many other academic disciplines, librarianship will soon be looking for a new generation of teachers with many retirements of library school faculty anticipated in the next few years. Open access and related topics are popular research areas for today's PhD students; within the next few years, many a library school will have one or more faculty members with expertise in this area. Speaking of PhD students, one of the early areas of rapid growth in open access has been OA archiving of theses. One of the results of this will be graduates - new faculty members, new professionals and businesspeople - who are knowledgeable about open access, a whole new group likely to produce more than its fair share of advocates and OA supporters. My prediction is that researchers will begin to prioritize learning about open access in response to mandates from funding agencies, and the more they learn about open access and related initiatives such as open data, the more they will embrace and support it. Educational efforts by librarians and others will be a very helpful factor along the way; the policy mandates will provide the incentives, and librarians will be increasing ready to help provide the information and needed support. The most important thing I see happening in 2007, however, is less tangible in nature, but rather a shift in perspective; from debating the pros, cons, and possibilities of open access, to a focus on how to implement. For librarians, the key trend I predict for 2007 is a shift in perspective on library collections, from a focus on collections as purchase or lease, to one of building and preserving collections. This is a subtle shift, and arguably one that reflects a return to more traditional values, which is nevertheless key to the transition. Once we understand that building and preserving collections of the work of our researchers for everyone to share is the very essence of librarianship, everything else will fall into place, in my view. This is an increase of 113 titles from September - December 2006, a 4.7% growth rate or the equivalent of 19% annually. The total title increase in 2006 was 526, a 26% increase over the year, or an average increase of almost one and a half titles per calendar day. Please note that this figure likely underestimates actual growth, as it reflects a thorough weeding project early in 2006. This is an increase of 50 journal titles during September - December, 2006; a 7% growth rate, or equivalent of an annual 28% growth rate. This is an increase of 514,138 records in a quarter, or an equivalent of over 2 million records annually. By percentage, this is an 5% increase in this quarter, or an equivalent of about 20% annually (a much lower increase than the previous quarter). The number of institutions has increased by 46, 7%, or the equivalent of 28% annually. For all of 2006 (Dec. 22, 2005 - Dec. 21, 2006), OAIster increased by 3,676,311 records, a 59% increase in records; and 148 institutions, a 26% increase. 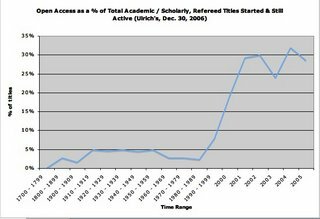 The Registry of Open Access Repositories lists 792 archives as of December 31, 2006, up from 746 on September 30, 2006, an increase of 46 or 6%, equivalent of 24% annual increase. This is an increase of 116,543 articles, or a 8% increase (equivalent to 32% annually). For all of 2006, this is an increase of 421,332 articles, or a 37% annual increase. 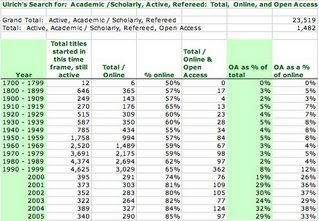 September 30, 2006: 696,503 OAI records, 100% freely accessible (data from the Registry of Open Access Repositories (ROAR) by Dr. Tim Brody. The ROAR site shows the impressive, if only beginning, growth curve of PMC. This is an increase of 69,884 records in a quarter, a 10% increase or equivalent of 40% annual growth. This is an increase of 14,098 e-prints in this quarter, a 3.6% increase in this quarter, or the equivalent of 15% annually. For all of 2006, this is an increase of 50,069 e-prints, a 14% increase. This is an increase of 23,000 items available online, a 5% increase, or the equivalent of a 20% annual increase. For all of 2006, this is an increase of 101,000 items of interest, a 29% increase. This is an increase of 586 documents, 14% or the equivalent of a 55% annual increase. For all of 2006, this is an increase of 1,776 documents, a 57% increase. This is an increase of 710 items, or a 2.9% increase (equivalent of 12% annually), significantly lower than the apparent growth of last quarter but significantly more than the growth of the second quarter of the year. The increase from the equivalent of a 4% annual growth rate to a 12% annual growth is likely more realistic; the third quarter includes metadata-only records added in error by one of the archives, which have subsequently been removed. For all of 2006, this is an increase of 3,158 records, or a 14% increase. 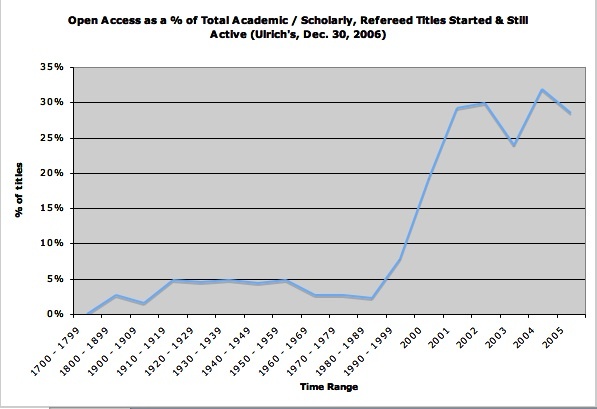 Other excellent sources of data for illustrating the Dramatic Growth of Open Access: the Registry of Open Access Repositories (ROAR) , by Dr. Tim Brody, which provides the number of OAI records for 746 archives, an estimated percentage that are fulltext, and charts illustrating the growth of each archive. The University of Michigan Digital Library Production Service's OAIster now also features growth charts for archives and records harvested. Data derived from Ulrich's Periodicals Directory illustrates a strong and positive correlation between the recency of a journal's start date and open access: the more recent the start, the more likely the journal is open access. None of the titles started in the 1700's that are still active are open access. The percentage of titles started from the early 1800's to the end of 1999 never rises to the double digits. The number of titles started in 2000 rises to 19%, while the percentage of new journals classified as open access by Ulrich's is about 30% in this millenium. Basic data in spreadsheet and chart form follows. To its credit, Cambridge Scientific Abstracts' for-profit Ulrich's Periodicals Directory, long considered an authoritative service on periodicals information by libraries, publishers, and others, is including open access journals. The Directory of Open Access Journals provides the highly valuable service of vetting journals both for appropriate scholarly quality controls, and open access status. Surely a business relationship would make sense here? The benefits would be consistent, quality information on open access journals for Ulrich's, saving Ulrich's staff time on the vetting process; and, funds for DOAJ, to help establish a sustainable business model for this essential service. This makes so much sense for us librarians ~ perhaps we should call our CSA rep with this suggestion? Here is a bit of background explaining how I came up with this idea. Ulrich's does not post their definition of open access on their web site. However, based on a bit of research, my best guess is that Urlich's practical definition of open access would appear to be "included in the Directory of Open Access Journals". For example, a Dec. 30, 2006 search of Academic / Scholarly, Online, Refereed, Open Access Journals with a start date of 2006, yields a list of 36 titles. All 36 titles are found in the Directory of Open Access Journals. This is an excellent approach, as DOAJ is indeed considered an authority on open access, peer reviewed journals, as all titles are vetted for both criteria by a professional librarian before being added to DOAJ. However, Ulrich's approach seems to be somewhat inconsistent. 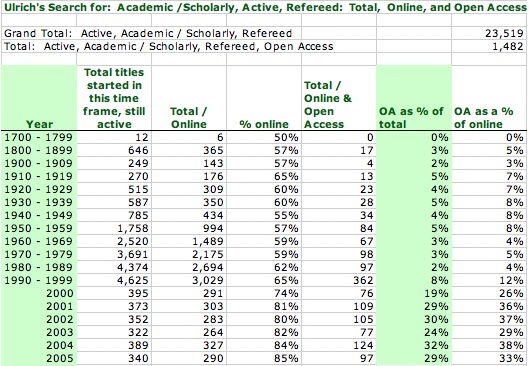 While DOAJ includes 2,514 titles as of December 30, 2006, an Ulrich search for Academic / Scholarly, Online, Refereed, Open Access titles, includes only 1,482 titles. There are indications that some of these titles are actually in Ulrich's, but the open access designation has been missed. For example, BioMed Central's new title, Chinese Medicine, is listed in Ulrich's, but does not appear on the 2006 start date / open access list. Another example: a search for "Hindawi" as publisher yields 51 titles, but a search for ""Hindawi" as publisher and open access" yields only 26 titles (Hindawi currently has 50 open access titles). Also, a search for "Public Library of Science" as publisher yields 8 titles; a search for "Public Library of Science and open access" yields only 6 titles. So, here is the suggestion. Obviously, it benefits both Ulrich's and its customers to include open access titles. Since DOAJ is already doing the work of vetting titles both for scholarly quality control and for full open access, would it not benefit Ulrich's to contract with DOAJ to receive the DOAJ title lists on a regular basis? This would provide Ulrich's with quality, consistent information for open access titles - and, such a business arrangement should be helpful to DOAJ to establish a sustainable funding structure. Considering the benefits of having this kind of consistent quality for open access titles in Ulrich's - shouldn't we librarians be asking our Ulrich's reps to make this happen? This post is the sixth in the Transitioning to Open Access Series. Some of the opposition to open access appears to stem simply from a very human, and very natural, fear of change. In a recent very well-written post to Liblicense, Sandy Thatcher, Director of Penn State University Press, expresses the viewpoint that a critical mass of self-archived articles will cause sudden, nonlinear change, "a point at which major disruption to the system could occur, with at least very harmful short-term consequences". Sandy is concerned about the possibility of "a real "tipping point," which would lead some major publishers to abandon the field of STM journal publishing in the belief (however erroneous) that they could not sustain their expected profit margins under the new regime thus legislated". What Sandy is overlooking is the fact that if a few large, highly profitable publishers were to suddenly decide to go into other businesses - there would suddenly be large amounts of capital available from library budgets, to support university presses such as Penn State. So if, in such a scenario, there are "plenty of professors, administrators, and librarians appealing to us to expand our journals program", as Sandy predicts - no worries, they will have lots of cash! Then again, it is always possible that the publishers who are making hefty profits from scholarly publishing will stay in the business after all. Many thanks to Sandy for openly sharing this viewpoint. This kind of honest discourse will help us all to find the smoothest possible road through the transitional process. This post is the fifth in the series Transitioning to Open Access. The University of Toronto's Linda Hutcheon is one of Canada's more modest leaders of the open access movement. Here are some of Linda's words of wisdom, from a SPARC Scholars Speak interview: "Open access removes barriers. I find this very politically attractive. The sharing of knowledge helps us get at economic inequities – experienced both by smaller academic institutions and, of course, by developing countries. Everybody wins. More access and resource sharing lead to a democratized diffusion of knowledge". Linda also points out that the biggest barrier to change is simply time; people are just busy to learn and implement change. The good news here: in the medium to long term - this is no barrier at all. Another topic Linda brings up that we don't hear about as often is the monographs crisis. As library budgets have been diverted from the purchase of monographs to meet the ever-increasing serials prices, fewere monographs have been purchased - and now, fewer are being published, even though this form remains critical in the humanities. One of Linda's solutions: rethinking university presses, with more support from universities so that they do not need to compete with commercial companies, but rather focus on academic work. This post is the third in the series Canadian Leadership in the Open Access Movement. John Willinsky's outstanding theoretical contributions have been recognized by the American Library Association, who awarded the 2006 Blackwell Scholarship Award for John's book The Access Principle (also available in DLIST. Links to more of John's works can be found from the PKP Publications page. The Public Knowledge Project (PKP) is best known for its open source software - particularly Open Journal Systems (OJS) , a free, open source journal publishing software platform. Since its release on November 8, 2002, an event noted on Peter Suber's Open Access Timeline, OJS has become the publishing platform for over 800 journals, in 10 languages, around the world, greatly facilitating open access publishing. Examples of projects and journals using OJS: AJOL, African Journals Online, Revista Brasileira de Entomologia. OJS is used not only around the globe, but also right here in Canada - for example, by Theoretical Economics, hosted by the University of Toronto. OJS is the platform of choice for another Canadian open access leadership initiative, the International Coalition for the Advancement of Academic Publication at Athabasca University. OJS is also in use at the University of Alberta Libraries, publisher of Evidence Based Library and Information Practice, and the University of Guelph Library, host of Partnership: the Canadian Journal of Library and Information Practice and Research, both new open access journals. PKP also produces the open source Open Conference Systems and Open Archives Harvester. Initially developed at the University of British Columbia, in 2005 PKP became a joint project of the UBC Faculty of Education, Simon Fraser University Library, and the Canadian Center for Studies in Publishing at Simon Fraser University. Recently, PKP was the sole Canadian winner of the first annual Mellon Awards for Technology Collaboration. PKP is a partner of, and endorsed by, the Scholarly Publishing and Academic Resources Coalition. To learn more about PKP, meet the PKP team and other open access leaders (myself included!) plan to attend the First Annual PKP Scholarly Publishing Conference July 11 - 13, 2007, in Vancouver, British Columbia - one of the three best cities in the world to visit or live, according to the Economist Intelligence Unit. There's still plenty of time to submit a proposal to the Call for Papers. Disclosures: while I do not work for the PKP Project, I do work (indirectly) for one of the partners of the project - SFU Library, and I am on the planning committee for the PKP Scholarly Publishing conference.